STEM stands for Science, Technology, Engineering and Math and STEM products encourage kids to develop core skills in these areas, no matter what their core interests and strengths may be. I’m all about a very well-rounded education, filled with science, math, english, reading, sports, music, and more! The challenge, at times, can be to get your child to really put their all into all of these diverse subjects and disciplines. Some kids are artsy (Natalie) and some kids are scientific (Liam). These toys really help to make both of these types of kids understand the important parts of science and how it relates to our daily lives. 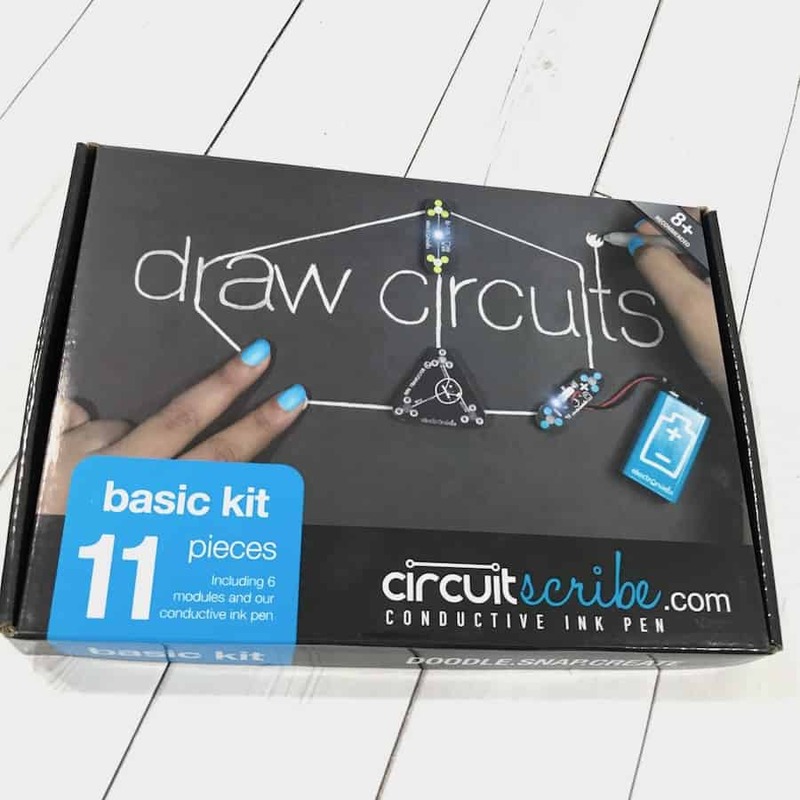 This Circuit Scribe Basic kit lets you plan your electrical circuit on paper and then build it with the included components. 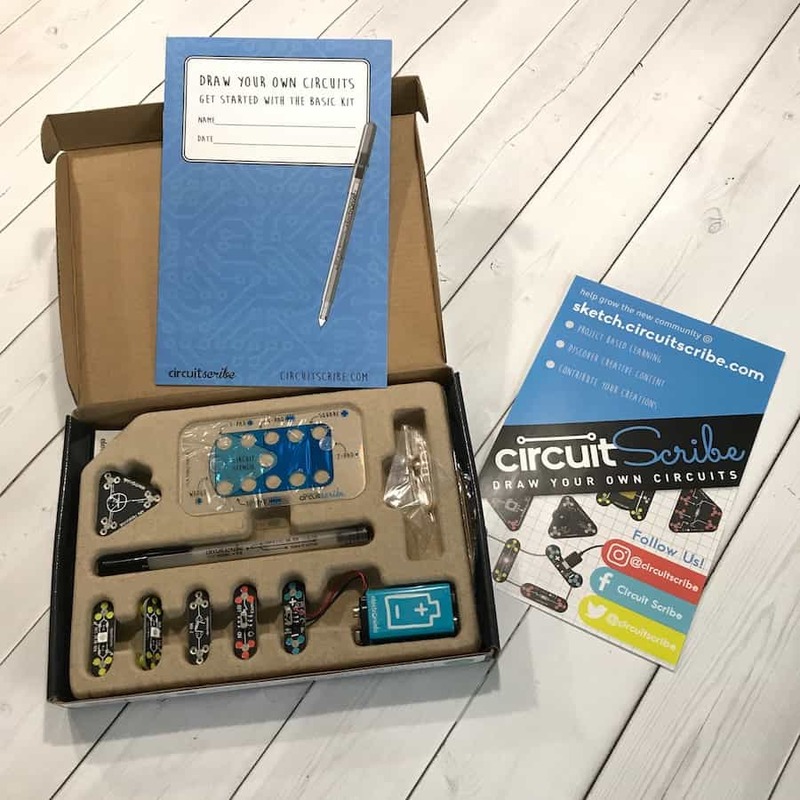 The Basic Kit Plus contains a workbook with 27 pages of lessons that works through resistance, elements in parallel and series, open and short circuits, and more. Work up to creating a touch-sensitive circuit using the NPN transistor. It’s really cool to see your child just create an electric circuit with a metallic-ink pen that lights up. 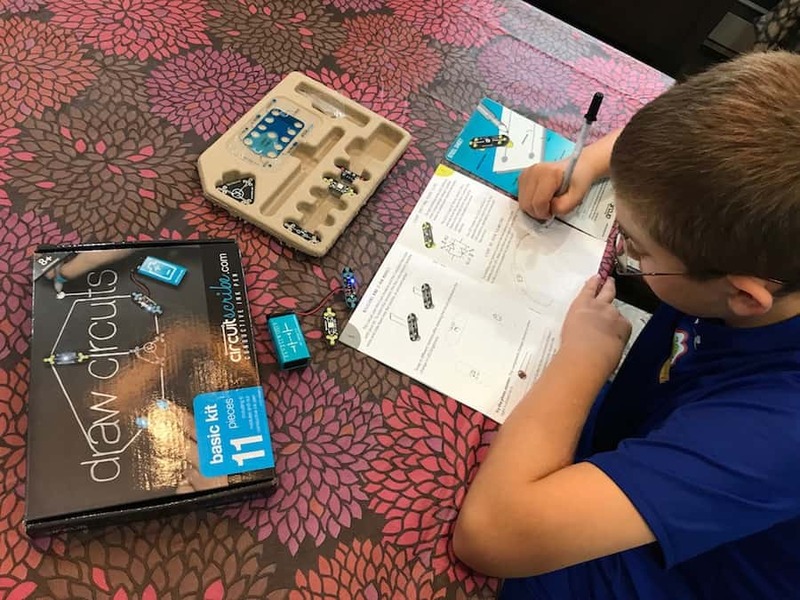 It’s a great, easy, and very fun way to help them understand how electricity and circuits work. It’s such an important part of modern life that’s so common that most people don’t give it a second thought. So it makes it even that much more powerful to see them learn and understand how it all works. Liam loves it! He makes new circuit designs all the time, never ceasing to marvel at how it all works. 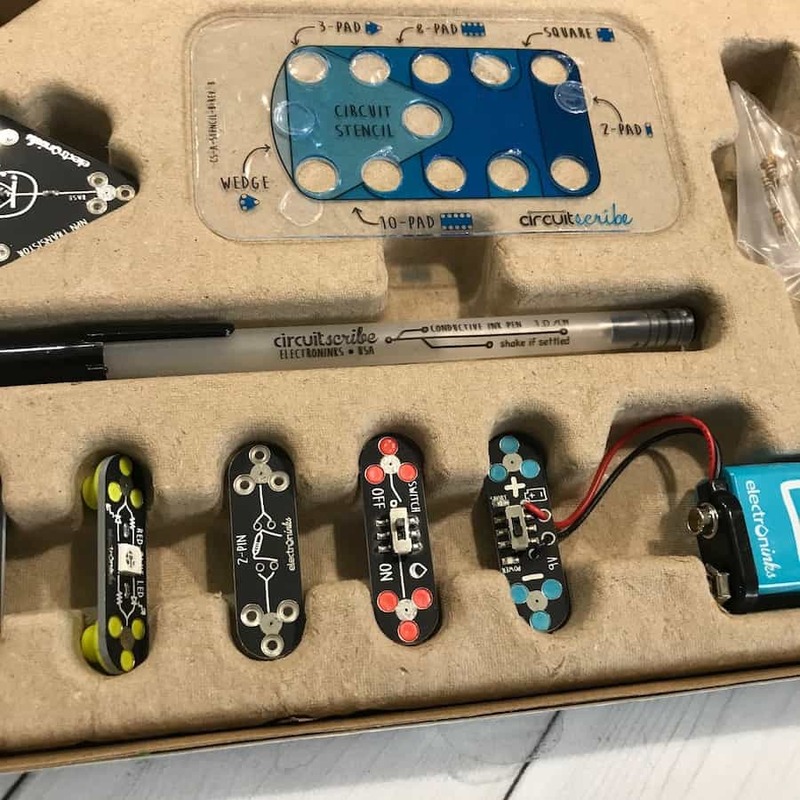 Helpful online platform sketch.circuitscribe.com to learn additional instructions for all age types and the toy is suitable for ages 8 and up. Check out the following video and see the coolness, the magic, the awesome of this STEM toy! Get your kid into science as much as mine are, with the help of this fun toy. It’s great…and now you can really see what I mean! Awesome, yes? Seriously, I’ve been playing with this, just a little bit. It’s just really interesting and really well done. A great job all around. That is so great! Getting the kids excited about STEM is one of the most important things we can do. My son would love this. This is awesome. My kids LOVE stem and this would be really fun for them. Getting kids excited about stem and wanting to learn more is one of my goals! This looks absolutely amazing! My son would be on cloud 9 if we got this for him. My daughter loves tinkering with electronics. She would love this! It’s really good to have the kids involved in science and to allow them to make their own experiments as well. This is a pretty awesome set to give to the kids! It’s going to make them learn while having fun. It’s such a nice gift for the kids to get them to be more interested in science. I have always liked giving kids educational toys that are also fun. This is definitely something that I’ll buy for them! I am loving all these things we can get to boost a child’s interest in STEM. I wish we had this when my kids were growing up. If this was available back then, they would have been in a different career today. I have young nephews and nieces who would benefit greatly from this. I will let their moms know. This is a fantastic way to get kids interested in electronics! I don’t have small kids anymore but I would definitely recommend this to friends and family with young children. This is so great for kids! Awesome to get them interested in electronics – it’s so important in the technological world we live in! Loving this – I have to grab one for my nephew. He would just love it!